When it comes to luxury houses, elegance is obviously a priority. But even though air conditioners may be the first option many think about for cooling down those mansions, not everybody likes that kind of cold. Also, some would not like the way decorative the air conditioners are designed as they might not exactly match a traditional luxury décor. In that sense, the best option could be an elegant ceiling fan with crystals, which will accomplish the task of refreshing any room in the house (especially living rooms or dinners) and is more versatile when it comes to achieving a traditionally luxurious decoration. Chandeliers, crystal, and lamps are the most common kind of ornamentation that we can find on these models, and that can’t be found on an air conditioner. If you’re looking for a discrete or obvious ceiling fan that can represent all the elegance of your mansion, then you need to keep reading this review. 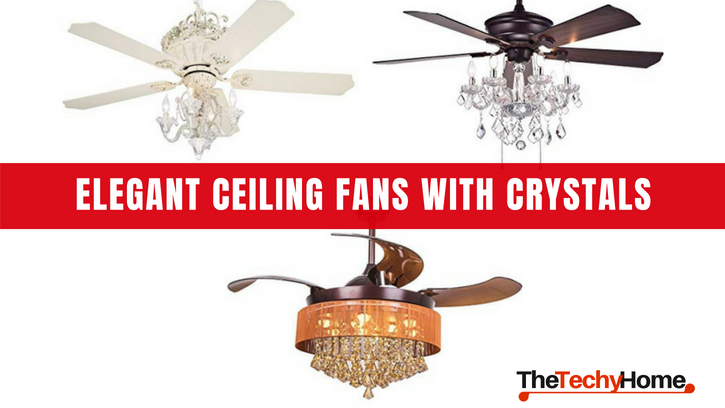 Below we present the list of top-rated elegant ceiling fans with crystals and lights to give your lavish property and give it the opulent atmosphere that you deserve. 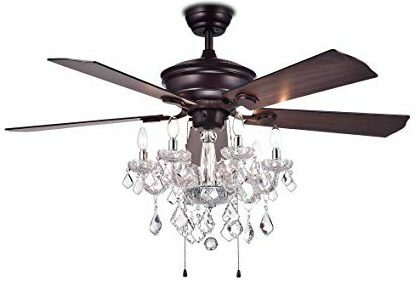 A very luxurious – yet classic and simple enough – version of the standard can-type fans, this crystal chandelier ceiling fan combo adds elegance to your home without being TOO ostentatious. Its beautiful chandelier counts with a great variation of crystal glass shapes that endorse the 6 lights and a very sober antique bronze finish. Its 5 wooden blades with a reversible motor allow cooling down any living or dinner while its strong metal base assures a long lasting functioning. 3 airflow speeds for adjusting the refreshing. Wooden and metal construction is strong while its true crystal chandelier is astonishing and bright. CSA, ETL, and UL listed. Luxurious yet sober enough design. The crystal chandelier is really delicate and needs to be wired separately. Users report that the package lacks some essential hardware to install. Quite different from the previous model, this Crystal Chandelier Ceiling Fan combo is a bit more elaborated piece of decoration. While not using the pendant-crystal style, but a bowl design with stained-glass-like motive, it is better suited for high ceilings. The combination of these features with an Antique bronze finish will offer your home a very luxurious, yet more artistic atmosphere. With 5 stained real wood blades and a powerful silent motor, you’ll get the airflow you need while offering a soft light to your room. While it doesn’t include a dimmer, you can install it separately to enjoy the goodness of an even more subtle light. 3 very powerful airspeeds to keep your house as cool as you need. 5 real wood blades are durable and strong. The stained-glass-like design offers a beautiful light pattern. Complicated assembly and installation would need a professional. Bulbs are not only not included, but they will be also really hard to replace when needed as the access to the light installation is hard because of the design. Really long it will not be suitable for low ceilings. 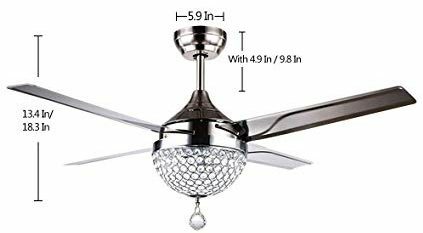 This luxurious fan is ideal for those ones that like fancy details; a crystal ball unique pendant that outstands from the crystal bowl makes this a very chick and modern bling ceiling fan. 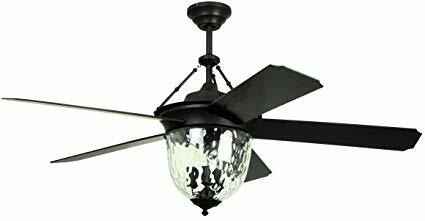 Besides, its beautiful 4 stainless steel blades with a satin silver finish will give your living room that modern and sophisticated style that antique elegant ceiling fans with crystals may not offer. The motor is powerful and durable while being really quiet, offering the perfect cooling for a reunion room. The lights are variable and while not dimmable, they adjust to 3 different intensities to provide the perfect ambiance. Both lights and fan can be controlled separately with an included remote. Remote controller included with timing feature and separate control of lights and fan. 3 airspeeds and 3 light intensities: white, neutral and warm. Very quiet yet potent motor. While it’s operated with the remote when on, it must be turned on/off with the manual switch. It’s really smaller than it looks like in the pictures. Not a reliable brand, users report materials are not so good. If you’re more into a more Gothic-English style with dark tones and sober design, then this luxury ceiling fan is the right piece for you, with its 5 bronze dark aged blades and its hammered glass light. This elegant ceiling fan with crystals resembles an aged English lantern, yes, but it couldn’t be more modern when it comes to technology. This great model is controlled with an included remote and is designed to be compatible with Alexa, even though the devices are sold separately. The remote allows a full range dimming of the 3 40-watts included bulbs and also controls the reverse function. While having a potent airflow and very quiet performance its strong and careful crafting allows using it in the outsides. Its resistant materials endure the elements and give that elegant and sober luxury touch to your outside spaces, as well as inside rooms. Highly resistant and everlasting structure in both the blades and the light bowl. 3 airspeeds and dimmable light controlled by included remote. It’s not Alexa compatible right out of the box, you need to purchase extra products. Needs 9-volt batteries to work. 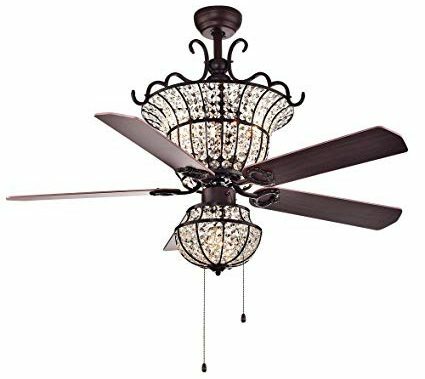 If you prefer the total opposite, and like a dollhouse-like yet sober antique design, then this luxury ceiling fan is for you. While it’s still very elegant, the white candy style resembles the Marie-Antoinette age where everything was extremely luxurious while excessive. Nevertheless, this model preserves a bit of moderation on the Baroque style lacking pendants or overcharged setoffs. Ideal for a girl’s room it includes delicate soft pink details combined with a milky white that makes it look delicious as a cake. Hand-rubbed antique finish in the motor housing. Low-profile adaptable, ideal for bedrooms and low ceiling rooms. Interchangeable white and rose details. 3 airspeed reversible motor with pull chain control. Really heavy needs to be installed in a heavy-duty box. Complicated assembling needs a professional. The light-kit is acrylic-like plastic, no glass. 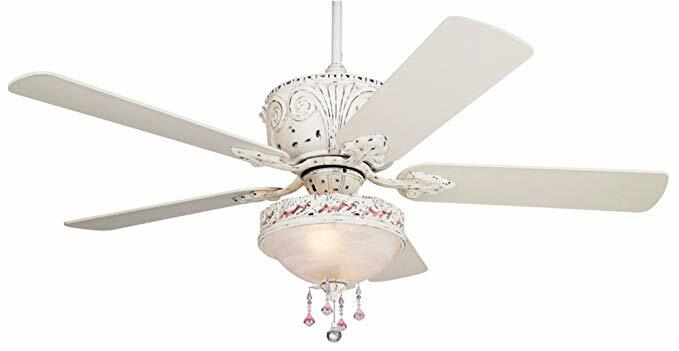 Within the same Marie-Antoinette style but with much more elegant ceiling fan with crystals style, we find this completely white candelabra-like luxury ceiling fan with lights. It displays a heavy Baroque setoff full of ornamentation that will exalt the most luxurious living rooms and dinners. Due to its long structure, it’s designed for a 9-foot ceiling minimum and, thanks to its powerful 3-speeds reversible motor, these big rooms will be as cool as you desire. Also, it includes 4 40-watt candelabra bulbs that will give you the perfect illumination while not being dazzling. Very powerful motor, 3-airspeeds are potent yet quiet, ideal for girls’ rooms. Installation is complex may need a professional. Really heavy, make sure the ceiling holds. The color is more like ivory or cream, so make sure it combines with your decoration. 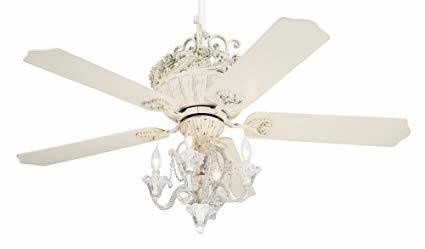 This chandelier like crystal ceiling fan with lights is particularly decorative as you can completely hide the fan blades. Its retractable system allows transforming this product discretely to become a very decorative lamp while the fan is not in use. The best part is that the blades are automatic and retract by themselves every time the fan is turned off while stretching out when it’s on. And don’t worry; the lights and fan are controlled separately with a remote controller! On the other hand, the design is quite bold and modern while keeping an antique reminiscence in the crystal pendants. These pendants offer a textures pattern in your walls when the lights are on. It includes 9 LED replaceable light bulbs. Include 2 down rods that can be customizable. 3 airspeeds with great air flow. Blades are acrylic which makes them really modern and resistant. Blade automatic system makes it simple to change from fan to decorative chandelier. Assembly is complicated would need a professional. Silver strings of the crystal pendants are easy to break. If you try to install a wall switch for controlling it, you may damage the circuit. No dimmer option for the lights. As the name implies, this elegant ceiling fan with crystal was inspired in Queen Catalina of Aragon style. 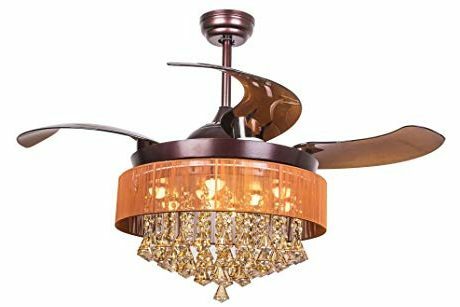 This style displays beautiful glass designs combined with fine wood and bronze colors in a refined and elegant finish, which is exactly what this luxury ceiling fan with light has to offer. The beautiful lamp uses 3 60-watts Type bulbs that inflict a shade pattern in the wall which is not intrusive but very decorative. On the other hand, the blades are bronzed-finished for a very refined yet traditional touch. It’s ideal for those ones with a sophisticated yet sober taste. The performance is another remarkable feature of this fan as it blows a great amount of airflow while being very quiet. The whole structure is thoroughly made and very resistant, guaranteeing a long-lasting product. The elegant yet simple design combines with different kinds of decoration. 36” of supply wire included. Well-made structure and metal blades are long-lasting. Moves a lot of air in any of the 3 airspeeds. Energy Star and UL listed. Hard to install may need a professional. Without a doubt the best option in an elegant ceiling fan with crystal. This model is almost 5 stars in Amazon due to its great design, construction, and performance. Unlike many crystal ceiling fans with lights, the design in this model makes it nearly impossible to break or bend while transporting. While it may not be as pompous as many of the other models in this review, the top-quality materials and craft make it superior to the rest. Pictures don’t make justice to the beautiful pattern in the crystals. Of course, it’s not chandelier style and the luxury of this fan is much more modern and sophisticated but once installed the refined touch it offers to any room is undeniable. For those skeptical ones, it may be interesting to know that this product actually has won prices due to its outstanding design/performance relation. The best part is that it’s not really expensive; other models like this one may even run the $1000 but this is only slightly over $200. Beautiful design the only one in Amazon’s available fan to have won a design prize. Very well-made (not cheap) crystal (glass or acrylic) lamp and chocolate finish blades. Full range dimming function with beautiful light effect in the wall. Remote control included for operating the 3 airspeeds of the fan and the dimmable lights. Really strong airflow for large rooms up to 400sq ft.
Can be installed in angle. 4 40-watt candelabra bulbs included. Difficult to install may need a professional. Not so quiet for bedrooms. Reverse button not included in the remote.